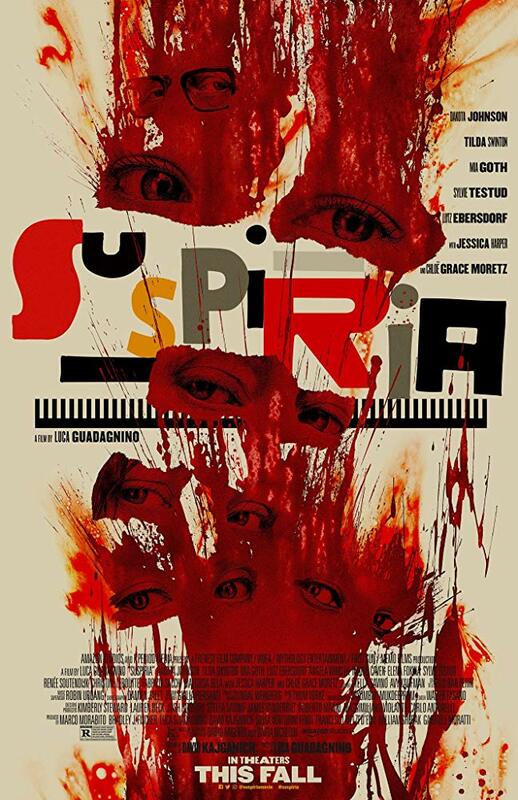 If you want to watch Suspiria (2018), please consider renting or purchasing the movie through this amazon link to help us support the podcast. Suspiria takes place in the politically tumultuous 1977’s Berlin and follows a young woman, Susie Bannion, played by Dakota Johnson, seeking out her dream to dance in the famed Tanz Dance Academy under her idol Madame Blanc, played by Tilda Swinton. Not everything is right in the dance academy. The movie opens with a frantic and distressed dancer Patricia, played by Chloe Grace Moretz, visiting her psychiatrist, Dr. Josef Klemperer, played by…Lutz Ebersdorf (We’ll get to him later). Patricia’s frantic and panicked statements about the academy come off as schizophrenic and delusional to Dr. Klemperer, but are an omen of things to come. We find out that the dance studio is undergoing a crisis of leadership as the company is split between having the unseen founder, Helena Markos, continue as the president (?) or Madame Blanc, the artistic director. As Susie gets integrated into the dance studio and quickly ascends to the principal dancer, Dr. Klemperer and another dancer named Sara, played by Mia Goth investigate what is going on at Tanz Dance Academy. This is undeniably a good movie, but depending on your tastes and comfort level, it might not be worth seeing. David was HIGHLY disturbed by this movie. The film deals with many different concepts at once, and features many concurrent protagonists, so there is a lot going on at the same time. At 2 hours and 32 minutes, there is plenty of time to explore the characters and themes, but I still came away with questions about what exactly I just witnessed. While trying to navigate the labyrinthian plot, the viewer is exposed to some of the most disturbing body horror in recent memory. The film is very dark, paranoid, and nihilistic. The acting is superb, and fills in the gaps of the script, that really doesn’t do you a lot of favors in spelling out what is going on. It is a very effective film and should stick with you and give you plenty to talk about with your friends. The production design and music are very strong in this movie, even though they may disappoint fans of the original 1977 Suspiria. The production design reminded me of the “Cheer up Charlie” part of Willy Wonka and the Chocolate Factory. The music is sparse but matches wonderfully with the movie. The score is the first by Thom Yorke of Radiohead, who now joins bandmates Johnny Greenwood and Phil Selway as film composers. I may be biased because Radiohead is my favorite band, but I think the music is a great match for the visuals. One of the first things to call out, and this isn’t really a spoiler about the movie, but more a spoiler about the production: Tilda Swinton Plays 3 roles in this movie. Dr. Klemperer is credited as being played by Lutz Ebersdorf. Ebersdorf roughly translates into “swine town” which is a play on Swinton. Swinton in interviews has stated that she did not play Dr Klemperer, but when questioned about whether she played Lutz Ebersdorf, she confirmed that she in fact did. The allusion to witchcraft in the first scene of the movie doesn’t take very long to be confirmed in the movie. We see that there are supernatural forces at play in the Tanz Dance Academy, and from appearances, Susie Bannion is all on board. Like I said before, the body horror in this film is intense. Early on in the film, as Susie is volunteering to dance the lead in the company, the dancer that she is replacing is meanwhile trapped in a mirrored dance room and tossed about by an unseen force. Tossed about is putting it lightly. I’ve seen McDonalds wrappers treated with more respect than this poor girl. I don’t want to completely spoil it, but here is a reaction video to give you an idea of how you might react. The finale of the film comes right after the performance of the dance that has been rehearsed throughout that we find is more of a grooming ritual for Susie. After the performance, everyone is led down to an underground lair to perform a Black Sabbath ritual to revive/reincarnate Mother Suspiriorum. It is assumed that Helena Markos will be revived from her degraded state (read zombie Frankenstein state) and be the Mother of sighs herself. What we see instead is a virtual bloodbath. Susie takes her place as Mother Suspiriorum and the movie ends with the only witness’ memory wiped.